Erick Huerta, Mobility Justice Team member, participated in a panel at ACT LA’s Transit Oriented Development #PeoplesTransit Town Hall with community members, transit users, and Metro representatives where they discussed how we can ensure transit investments support community development, anti-displacement strategies, quality employment, and more for low-income communities of color. 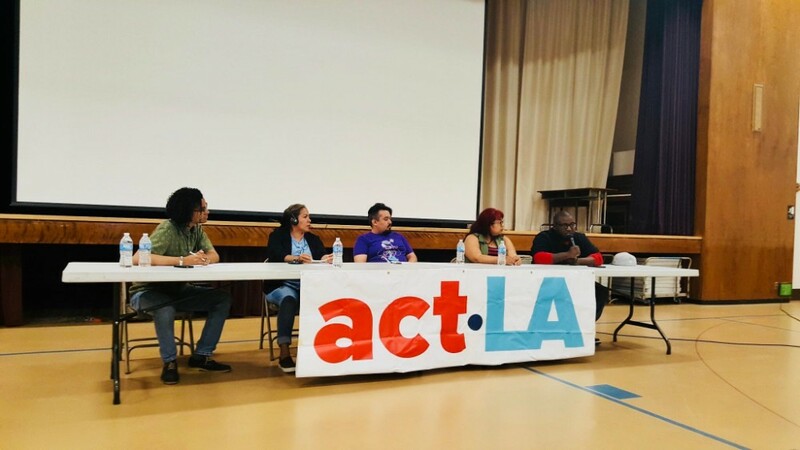 PMJ participates in coalitions such as ACT LA to share recommendations that prioritize the needs of our communities for housing security, transit access, and local jobs. Anisha Hingorani, PMJ board member, moderated the opening panel that brought planners, practitioners, and academics in conversation on spatial justice in Los Angeles and community-led creative resistance. Río Oxas, PMJ Policy & Programs Organizer, hosted a workshop “Queer Places in Urban Spaces” where they discussed urban planning and design considering the intersections of race, class, and sexuality and understanding the uneven experiences of queer communities in gentrifying urban spaces. Río provided examples of ways cities can develop policies to advance equity for queer communities of color and creative methods to advocate for socio-spatial justice for minority groups. Check out some recap tweets and photos here!